See our Prices page for representative prices, part numbers, and ordering information. Please contact us if you would like to custom order an air terminal that is not described on this page. Availability is generally two weeks for fixed rods and four weeks for all other products. We can supply aluminum and copper rods (AT) in any length from 10" to 6'. The copper rods are available with either nickel or tin plating. Each rod has a threaded base that can be screwed into a matching threaded hole in the superstructure, and a rounded tip. The photo on the right shows the bow air terminal on John Henry. In this case a 5/8-11 thread was tapped directly into the top of the aluminum bow pulpit rail. These customized devices provide a protective zone that covers the top of a carbon fiber mast. Please contact us with details of your application. The incorporation of an air terminal into a ratchet-mount base allows the rod to be lowered for bridge clearance, docking, fishing, or dinghy launch. Both rail-mount and surface-mount bases are available. The rail-mount (RMAT) can be used on either 7/8"-1" or 1 1/4"-1 1/2"diameter rails. The surface-mount (SMAT) comes with either a 2-way or 4-way option, where the 2-way is typically installed on a flat roof and the 4-way can accommodate any inclined surface. For installation on a fiberglass deck or cabin a though-connector is included while installation on an aluminum hull or superstructure requires only direct attachment on the surface. In our new SMAT-4S, we use an aluminum ferrule for joining the rod to the stainless base and provide an aluminum base plate for galvanic protection of the mounting surface. 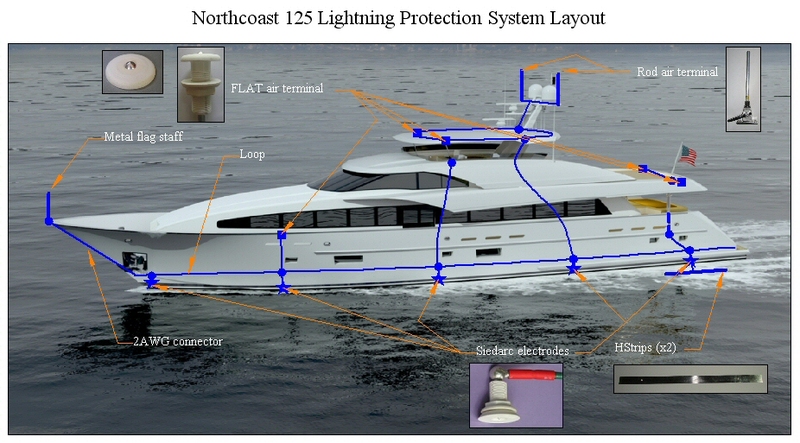 In many bluewater yachts the aesthetics of clean lines precludes the addition of exposed lightning rods. It is for this application that we have developed the flush-mount air terminal (FLAT) which is either barely visible, or can be made completely invisible, from the outside. When installed in a fiberglass coaming or handrail, the rod behaves just as it would in air since fiberglass is an insulator. Since these are all custom-made, many types of connections are possible, from a simple direct threading into the superstructure to 6' rods that pass through both handrail and deck to be connected to the loop conductor below.